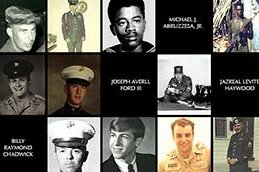 The public's help is needed to locate photos of 105 Pennsylvania service members who died as a result of the Vietnam War. The Pennsylvania Military and Veterans Affairs Department is hoping social media can help it obtain photos of 105 local service members who died in the Vietnam War for a virtual display being created in their honor. The images will appear online as part of a virtual Wall of Faces being created by the Vietnam Veterans Memorial Fund (VVMF) in Washington, D.C. to put a face and story to all of the men and women who gave the ultimate sacrifice in the war. The names of the Pennsylvania service members whose photos are still needed for the completion of the display can be found here. Instructions on how to submit a photo can be found here, or the photos can be mailed to the Vietnam Veterans Memorial Fund, Attn: The Wall of Faces, 1235 S. Clark St., Suite 910, Arlington, VA 22202.